Do you know that one of the reasons why Beats by Dr. Dre headphones look cool is the fact that we can see several celebrities wearing them? I don’t know when it started, but I guess pretty soon after the launch of Beats headphones in 2009. The company Beats Electronics, LLC was founded in 2006 by Dr. Dre and Interscope-Geffen-A&M Records chairman Jimmy Iovine. Beats products have been primarily manufactured and developed in collaboration with consumer electronics company Monster Cable, which was hugely successful. According to Wikipedia Beats headphones accounted for 53% of the monetary value of the headphones market in the year 2011. Last year HTC, Taiwanese manufacturer of smartphones and tablets, bought a 51 percent stake in Beats for $300 million. In 2011 American hip-hop artist 50 Cent decided that he, too, will try to get his share of the headphones market. He announced his line of headphones called Sleek by 50, but that project failed after only five months. In September 50 Cent broke the news that he’ll try again in his quest to become a serious player on the market – he has established SMS Audio and then acquired KonoAudio, a boutique manufacturer responsible for designing, developing and launching fashion headphones. 50 Cent currently has three models in his line-up: over-ear wireless headphones Sync by 50, over-ear and in-ear wired headphones Street by 50. As I predicted in the blog posts Sleek by 50 – serious competition for Beats by Dr. Dre? and SMS by 50 (or Sync by 50) – 50 Cent’s second shot at the headphones market, 50 Cent used similar methods for the promotion of his headphones as Beats by Dr. Dre. We have spotted his headphones in several music videos, although not in high-profile videos: 50 Cent had used lesser known artists, such as Hot Rod or Jasmine V.
In the last few months SMS Audio’s marketing department copied another successful method, used by Beats in the past. They have offered Street by 50 headphones to numerous high-profile sportsmen: football (soccer) players in Europe and NFL players in the USA. 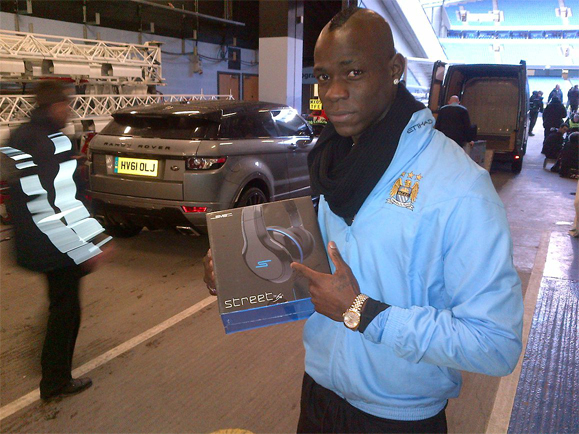 You can find photos of well-known football players with Street by 50 headphones: Jack Wilshere and Robin van Persie of Arsenal, Jermain Defoe of Tottenham, Mario Balotelli and Adam Johnson of Manchester City, Ashley Cole of Chelsea and Craig Bellamy of Liverpool among others. Besides football players we could saw photos of Super Bowl champions Victor Cruz & Hakeem Nicks of New York Giants who also got presents from 50 Cent. 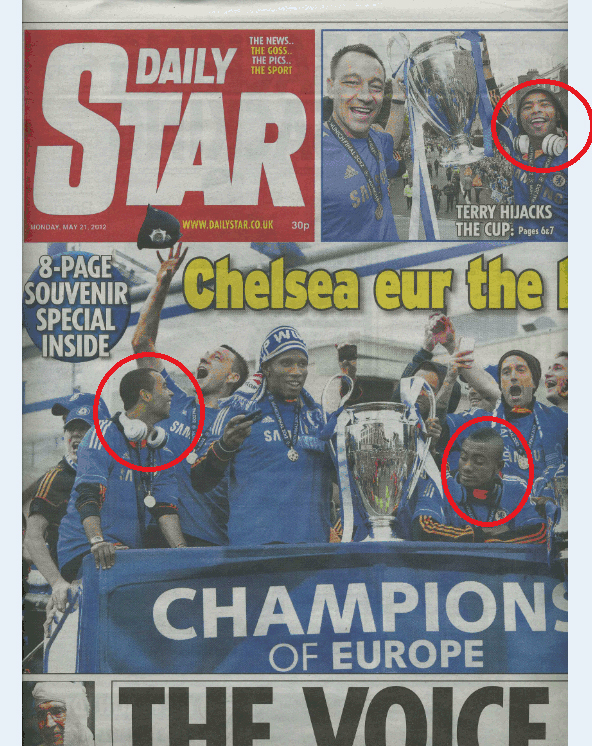 On Saturday, 19th May, Chelsea football team defeated Bayern in the Champions League final and thus won the most important football club trophy. The next day tens of thousands of fans gathered on the streets of London to celebrate Chelsea’s historic moment. At first sight this photo – and countless other photos with Cole, Kalou and SMS headphones, to be honest – could be categorized as a big win for SMS Audio. They’ve got a massive exposure for a relatively cheap investment. Okay, let’s presume that the only investment was headphones they gave footballers as gifts and not some additional fee for those two guys to actually wear headphones in public. But we shouldn’t underestimate THE CONTEXT. One thing is to see some football stars wearing headphones on the bus or before the game, but to wear them on a parade is something completely different. I’m not saying that it’s worse; it’s just out of context. Just put yourself in that situation: would you wear headphones on a parade? And if so, why would you? Would you be scared that you’ll get bored or you’ll need to listen to your favorite record for some strange reason? 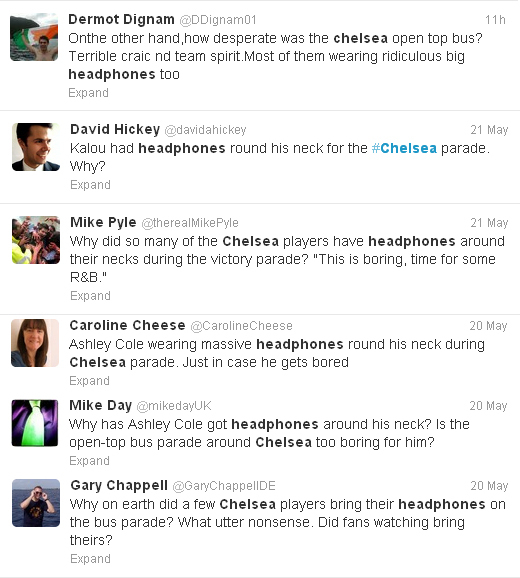 that I’m not the only one who has doubts about the appropriateness of wearing headphones on the parade.